The new water intake facility and pumping plant located on the Sacramento River, upstream of the town of Freeport, will divert water and pump it through pipelines to other FRWP facilities. Eight vertical turbine pumps with 2,000 horsepower electric induction motors have the capacity to pump up to 185 million gallons of water per day. Although the project’s primary purpose is to deliver water from to Sacramento County and the East Bay Municipal Utility District, the project also serves as a recreational connection and resting point at the southern edge of the city and provides access to the river. HLA’s design concept focused on water and its importance because the water agencies wanted public visitation and education. Quality and workmanship therefore become essential, and we used the Lithocrete process with seeded glass in pedestrian areas for added abrasion resistance and durability. In order to complete this job we had to use anywhere from 8-15 guys on a given day. 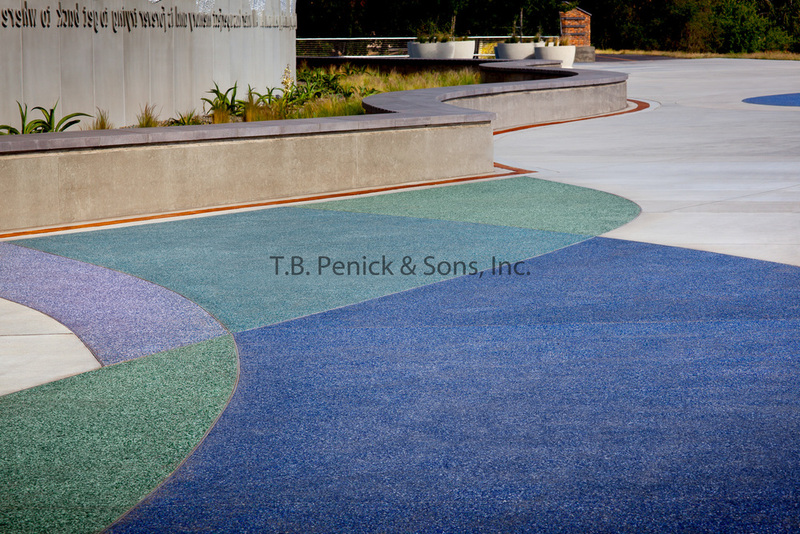 We used various colors and aggregates as materials in this project as well as the lithocrete. We used metal strips to add a new look as well as figure the pieces. To make the illusion of the bubbles we had to do a particular process where we used a piece of plywood to move it as we seeded the fading look of bubbles.